Abstract: The pervasiveness of software products in all areas of society has resulted in millions of software projects and a massive amount of data about their development, operation and maintenance. This huge amount of software engineering data is continuously generated at a rapid rate in many forms such as user stories, use cases, requirements, issue/bug reports, source code, test cases, execution logs and so on. In this talk, I will present our recent work in leveraging cutting-edge machine learning techniques (including deep learning) to develop a comprehensive suite of analytical methods which enable stakeholders to harvest valuable insights buried under these Big Data. 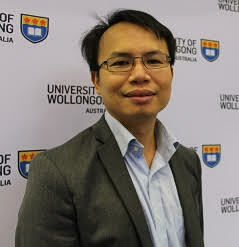 Presenter bio: Hoa Khanh Dam is a Senior Lecturer in the School of Computing and Information Technology, University of Wollongong (UOW) in Australia. He is Associate Director for the Decision System Lab at UOW, heading its Software Engineering Analytics research program. His research interests lie primarily in the intersection of software engineering analytics, process analytics and service analytics. He holds PhD and Master degrees in Computer Science from RMIT University, and Bachelor of Computer Science degree from the University of Melbourne in Australia. His research has won multiple Best Paper Awards (at WICSA, APCCM, and ASWEC) and ACM SIGSOFT Distinguished Paper Award (at MSR). His work has been published in the top venues in software engineering journals (IEEE TSE, JSS, EMSE) and conferences (ICSE, FSE, ASE), AI/intelligent agents (AAMAS, JAAMAS), and service-oriented computing (ICSOC, CaiSE, BPM). He has served as Program Chair, Organization Chair, Guest Editor, Journal Editorial Board, Steering Committee and (Senior) Program Committees for various international conferences and journals in his areas of expertise. Prior to his academic career, he spent a number of years in the industry at various positions, including technical architect, project manager and software engineer. Authorised by: Chief Marketing Officer, Strategic Marketing and Communications. Maintained by: IT Web master. Last updated: Mar 2018.